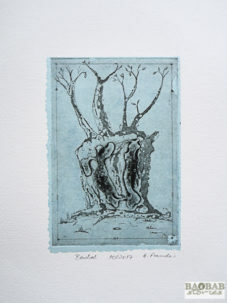 Baobabs seen in a different way: as works of art. 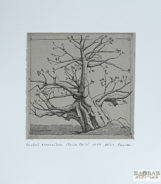 I captured tree studies on zinc plates for etchings, which are edited and printed manually. 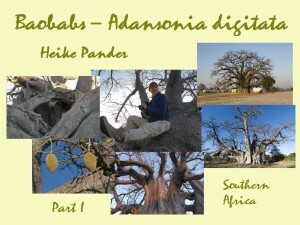 While travelling in southern and eastern Africa I regularly visit baobabs in their natural habitats. I have seen many of the impressive icons along the streets. I came across specimens beyond imagination – particularly in the countryside and in remote areas. Their variety of shapes, forms and tree architecture are fascinating and inspiring. Usually I take photographs or capture them in sketches. I prefer to travel in the dry season when the trees are leafless. At this time of the year the bizarre forms and gnarled branches are easy to see and I can concentrate on their structure. 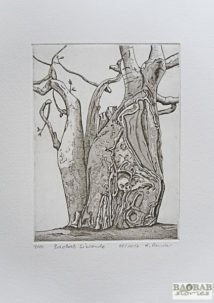 At home in the studio or in the printing workshop, my actual work from an artistic point of view begins. 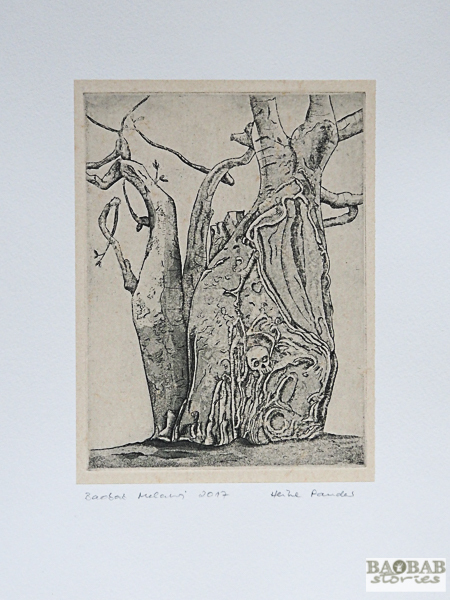 Until a few years ago, I drew baobab trees with pencil, charcoal or soft pastels mainly on handmade paper from Zimbabwe which is particularly suitable for working with the latter. A lucky coincidence helped me to discover etchings in the summer of 2016 in Berlin. The technique is part of graphics and belongs to the gravure printing process. It is based on printing motives from metal or plastic plates. Currently, my preferred working medium is the zinc plate in formats of 15 x 15 centimeters and 15 x 20 centimeters. The plates have to be filed at the edges. 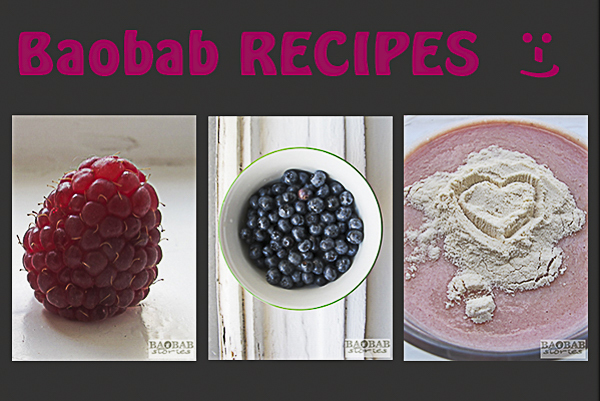 This results in the so-called facets, which serve to protect the felts during printing later. After filing the surface that will carry the etching has to be polished. How does the tree get onto the plate? In a next step I cover the plate with varnish and let it dry. Then I draw a rough structure of the baobab mirror-inverted and trace the fine lines on the plate with a sharp etching needle which violates the surface. Once I am satisfied with the drawing I put the plate in a bath of nitric acid. The duration of the acid bath depends on how strong and deep I want the lines to come out. The varnish protects the rest of the plate from the acid. I remove the varnish and apply gravure ink evenly. With gauze, I carefully wipe the zinc plate in the places that should remain white or at least bright. In the end color remains in the etched lines and gives a slight coloring of the plate. I put the etching on the printing press and cover it with a moistened sheet of handmade paper, cover it with felts and move it through the printing machine. I take out the print and the plate and inspect my work. Usually, further steps are necessary to add smaller branches, leaves, caves, shades and shadows, until I am satisfied with the result. 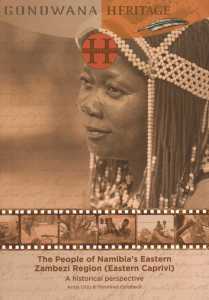 The final version is printed as editions or unique prints. 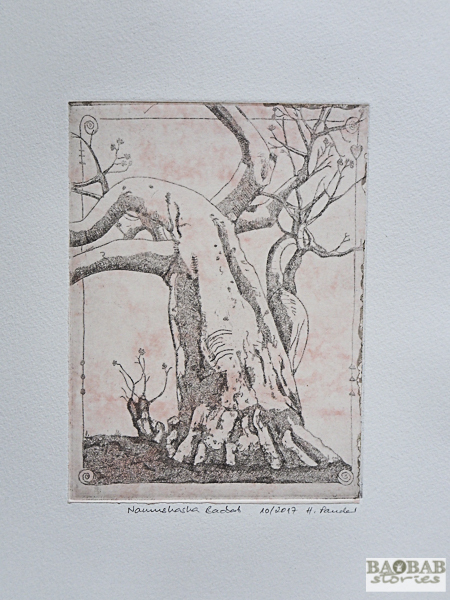 One of my first etchings was a baobab from Namushasha. The tree lives in the east of the Sambezi Province in Namibia. Approaching the “Heritage Center” and the nearby lodge was adventurous – I did not have a four-wheel drive vehicle and nearly got stuck in the sand several times. 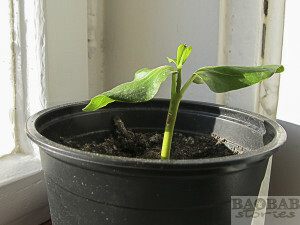 The rough ride was worth the effort: a huge double baobab grows in the center of the local museum. Presumably it sprouted from two different seeds close to each other. 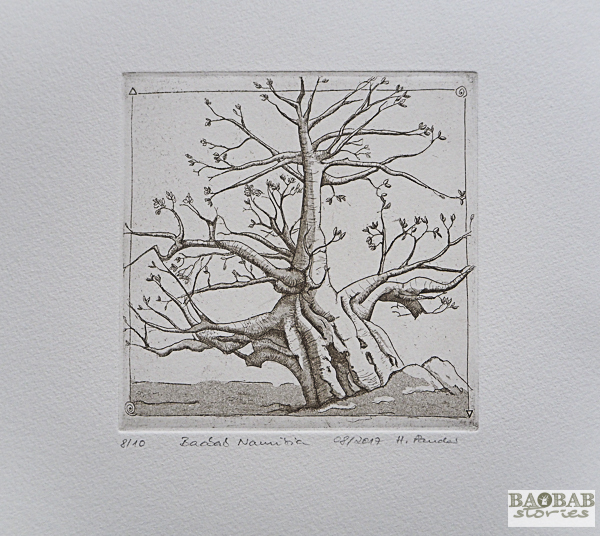 Baobabs do not like to grow close to each other – the two specimens give a good idea of that. Since they are anchored with their roots in the ground at the spots where the seeds germinated long time ago, they tried hard to grow as far apart as possible – at least with their treetops – a fascinating sight to me. 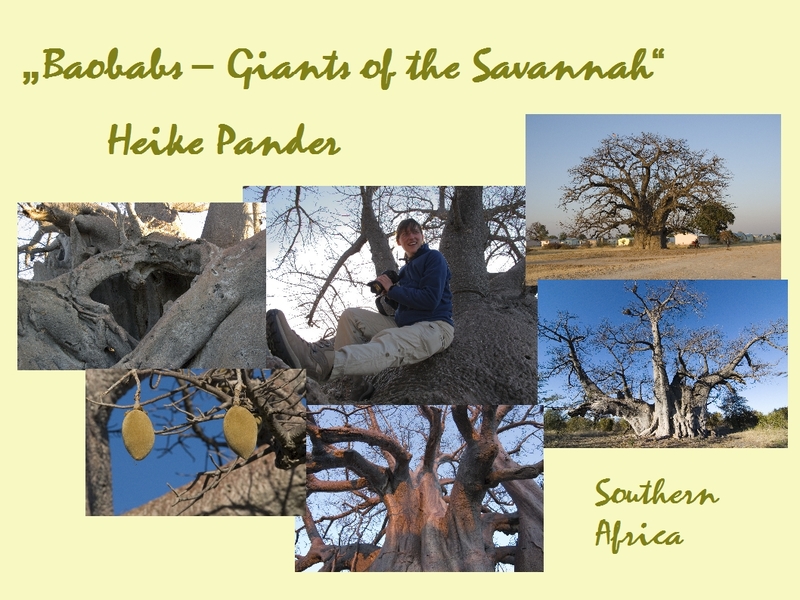 While I stayed at the lodge I did not only take numerous photographs of baobabs, but contributed a chapter about the giants for the book “The People of Namibia’s Eastern Zambezi Region (Eastern Caprivi)”, Gondwana Publishers, Namibia. 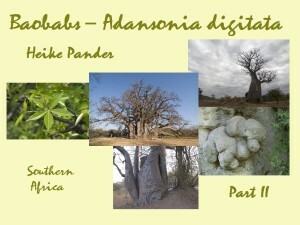 Another fascinating baobab grows in Malawi at Liwonde National Park – near the park entrance. It has a large opening on the side which allows a glimpse into the interior. An unsettling sight, because the tree is shelter to human remains: skulls and bones are still clearly visible. Meanwhile, several Baobabs have emerged as pieces of art. 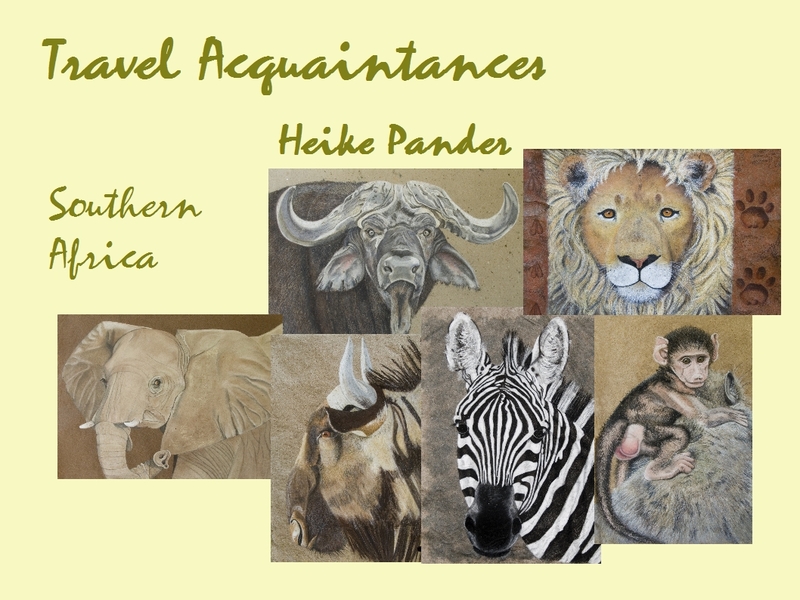 I am currently working on the illustrations of a book featuring baobabs. I expect to be finished with the fairy tale for adults by the end of 2018. 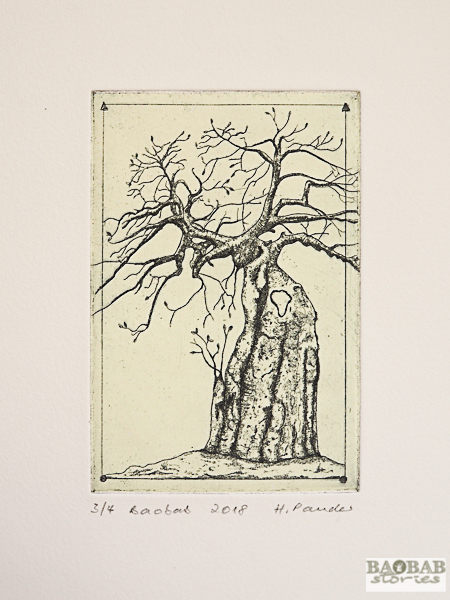 This entry was posted in Art & Artists, Baobab_Location and tagged Baobab Art, Baobabs, Etching, Liwonde, Malawi, Namibia, Namushasha, South Africa by Heike Pander. Bookmark the permalink.